The V.I.O 6" Flex Mount is designed for use with V.I.O. helmet cameras. The flexible steel rod holds your camera steady for capturing hard to get angles that standard mounts just can't capture. In addition, your hands are free to hold equipment, steer your bike or paddle, among other things, that will keep you safe and focused in the moment. 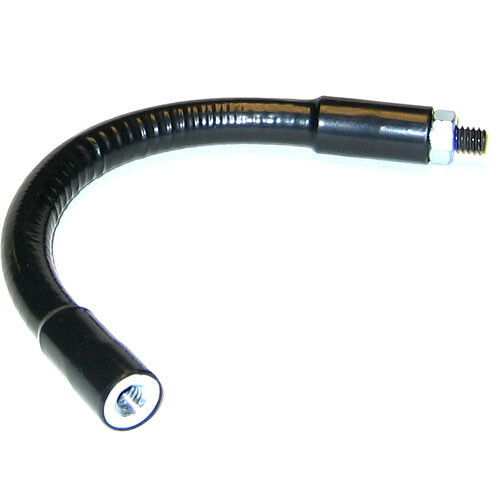 The mount features a 1/4-20 threaded male to 1/4-20 threaded female connector. Box Dimensions (LxWxH) 7.75 x 2.0 x 1.0"
6" Flex Mount is rated 5.0 out of 5 by 2. Rated 5 out of 5 by Manny the Tech Guy from 6-inch Flex Mount I have always been looking for a better way to hold a portable HD monitor for my DSLR rail or microphone or LCD light, I find this Flex Mount by V.I.O. to be just that. This is a direct replacement to articulating arms and does not break your wallet. I mount it on my 15 mm rail system to hook up a 10-inch monitor and it still holds up. It just needs one hand to adjust the view of the monitor when used with over the shoulder mount. I also find it useful with a light tripod for holding portable LCD light, LCD monitor or shotgun microphone when you need an extra hand. Rated 5 out of 5 by Anonymous from So Nice, I Bought it Twice! Using this to mount a small Sony still camera onto my video camera's tripod to take backup/safety/cutaway shots as I record video. It stays where you put it, takes up very little space, and permits very steady shots, especially when shooting stills using the camera's 2 second delay timer. Well-made, easy to use interface with 1/4-20 anchor points.